My heart is shattered. There are little, bitty pieces lying around my desk right now, because my heart has shattered! Kresley Cole has written such an epically amazing novel here that I can't seem to function just yet! There were SO many feels, so very many! Dead of Winter was pretty much the death of me! It seems each of these novels are destined to end on a cliffhanger that is sure to ruin me. The first one did, luckily I had book 2 at the ready and oh boy that second one was a doozie! Now I've read book 3 and there's no book 4 to help sate my need to KNOW! There was so much happening, that I am scrambling to know what will happen next! Evie has left Death's place, knowing that Jack has been kidnapped by the Lovers and is being subjected to their will and torture. She will do anything to save him because she loves him, though he has hurt her a great deal with his lies and withholding the truth. Evie returns to her friends and they make their plans to rescue Jack, no matter the cost. It seems Evie is willing to risk anyone and everyone just to get him back. Though the mission was a successful one, but with that victory comes Death. Aric has returned for Evie. There were extenuating circumstances that led to Evie just leaving Aric behind like she did, she thought herself in danger at the moment, and reacted, but before leaving she made sure that Aric would be safe until he recoups. Hence, part of the reason, why Aric comes back for her. Evie now finds herself in the dreaded love triangle. She loves both men, and doesn't know what to do. I for one, am Team Aric. The moment Jack lied was the moment he broke my trust in him. I can't stand liars. I could forgive him for his part in Evie's mother's death, but he should have spoken up long before he did. And Evie tries to deal with that and other trust issues that come between them. Aric has his faults too, don't get me wrong. But he does own up to them. Though I do still hesitate in trusting him completely, he hasn't broken any trust I have for him. Jack has. When Selena is kidnapped by the Lovers, Evie, Jack, and Aric set out once again to battle this hellacious duo. All the while, Evie does debate over the two guys who have stolen her heart. What irked me to no end, was that Evie tells them in a sense to leave her alone while she decides this, yet Jack takes any advantage he can, but when Aric tries, she pushes him back. That irks me. I get that Jack was her first and all that, but if she's going to let his kisses and touches slide, the same should apply for Aric. Despite my disdain for Evie in that matter, I did still enjoy her character. She has her flaws, like how she's willing to use and abuse her friends to save Jack, but she ends up feeling terrible afterward and it balances out the love/hate I feel for her. Needless to say the romance in this one was utterly epic! Both Jack and Aric are fighting to win Evie and both basically do whatever possible! Lots of swoony moments for me, I tell you! Though I won't say much on the outcome, Evie does come to a decision and if I speak one word of feeling over that, you'll know who she chose! LOL! The ending was once again another earth-shattering one! There was a great deal of action and then just as you think you know how things will turn out...BAM! Literally, BAM! In order to curb my sanity, I'll be needing the next book now Kresley! 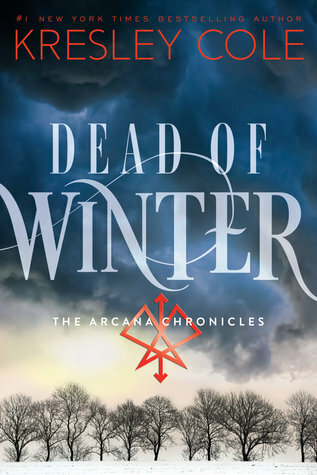 *grins* Dead of Winter was truly amazingly epic! That's the best description I can say about it! It took me a bit to get into this series, and there are times I still don't fully grasp the whole end game and how it came into fruition, but it's one of those things I just roll with! Otherwise, this read is just perfectly incredible! I really hadn't heard of this series still I seen it on your blog, now I am really curious..but I hate cliffhangers so maybe I will hold out for a while..lol. I love her Immortals After Dark series, but I still haven't find the time to read this one, even though I have the 1st book in the series. Glad you enjoyed it!